We recently raised questions about the role of the ‘Audience Producer’ for BBC Question Time and her role in manipulating and manufacturing audiences (‘BBC Question Time – Fake Audiences?’). 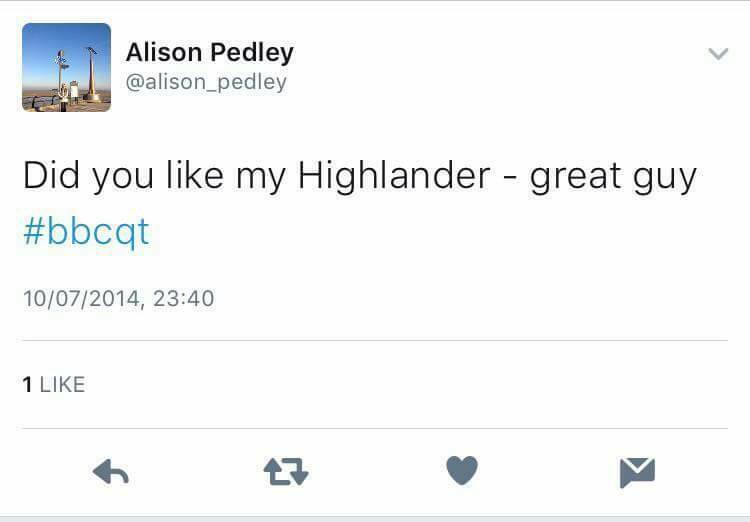 We suggested that Alison Fuller Pedley (see ‘My Highlander’ – right) was using her personal political beliefs to influence her professional life, and in doing so greatly distorting the whole experience and tone of the BBC’s ‘flagship’ current affairs programme. The self-perception of who and what the ‘nation’ is – is reflected back to us through the prism of the television news. All of this is in the context of the debate about ‘fake news’. We expected denial from the BBC and Mentorn Media, the Scottish-based programme who make Question Time. We first of all note the shift to emphasis on a ‘team’. You’ll note that the credit is for the Producer and no other team are listed. Which is interesting, but completely irrelevant. The idea that the further you outsource production somehow ringfences you from responsibility is daft. No-one ever suggested she did. We never suggested they did, rather we suggested the Audience Producer influenced the audience, because, er, that’s her job. This answer would have you believe that the Audience Producer for Question Time doesn’t know who Britain First are. You, like me, may find this a little difficult to believe. But if it is true then the accusation would switch from overt political bias to gross incompetence. This isn’t just a case of distortion from right to left or from No to Yes. Even if you’re a pro-Union conservative, or a middle of the road liberal, you might reflect that we are all done a disservice by this kind of manipulation and the resulting programme it creates. In an era when the commentariat are endlessly bemoaning the ‘quality of debate’ in political life, this is the reality of the production behind our state broadcaster’s flagship show. As the oldest saying goes – you shall know them by their fruits. At best, this silly person and the rest of her “team” seem to be trying to set up provocative programming. While having a pompous, senatorial MC. The Scottish episode with Farage and Galloway was also ultra-silly. Galloway solemnly telling teenagers that they were allowed to smoke at sixteen revealed how out of touch he is. That has not been the case in Scotland for many a year and teenagers would know it. I think the constant appearances from UKIP and Farage have been very damaging. As the oldest saying goes – you shall know them by their fruits. The fruits here are silly (and that’s me being polite). 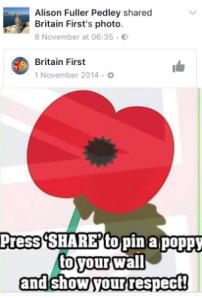 In fairness, I once reposted a Britain Frst poppy like that. I copied it from an ex-soldier friend so I figured it would be legit. Then another friend pointed out who Britain Frst were. Turned out the ex-soldier had done the same as me, he took it down as quickly as i did. So these things can happen unintentionally. Not every week they don’t. Another big difference. You’re not an audience picker for a political and current affair discussion show. There is a level of expertise and knowledge about politics and current affairs that should be demonstrated by such a person. They either demonstrated their knowledge (ie: they knew fine well) or their ignorance and either case illustrates their lack of suitability for the role. I just had to watch the video. It was honestly like watching a children’s play, where they have to have the words lip read to them by the teacher because they cannot remember, and being cued to feign some kind of conviction behind it. Even the “why should I bother using my inferior female scottish brain, its too much effort put me down for a noooo” lady on that abysmal advert was more convincing. As to the response,,, deal with authorities weekly, if not daily some times. All of that is indeed a deflection. If I dance around the words well enough, it might go away. Or as one eventually admitted to me, you never take responsibility, to do so would see them hung from a tree. Whether it comes from incompetence or direct bias, it’s all bad. The “team” may pick the final audience but they can only pick from what they’ve been presented with. Very poor. And who runs Mentorn? David Dimbleby who also happens to be employed by the BBC. So Pedley or whatever her name is, is subcontracted by a BBC employee whose company is in turn subcontracted by the BBC. Oh and did I mention it is allegedly produced for BBC Scotland to pauchle the number of supposedly Scottish programmes the corporation puts out? Theres a word they use for it that escapes me right now for Scottish produced programming under Scottish accounts , yet English wealth creation driven. This was brought up prior to the charter renewal , which then was suggested as yet another way of using Scottish licence payers money to appear to be “giving back” and as usual nothing has changed … and if mem serves it also is done so through mostly production companies based in England. I think the unmentionable indy site had an item on it around then , may even be also filed under some of the FOIRs to BBC also that were denied. If a system is open to manipulation it will be manipulated. This story is worth chasing. In a similar vein, I am reminded of the woman who took the Government to court re: Article 50. I would be very interested to know who this person is connected to in the City and in the wider financial world. Thus far, to my knowledge, she has been paraded by the MSM merely as a “concerned citizen” with all the implied innocence of that notion. Ah well, that’s ok, then … No matter who she may or may not be connected to, the woman in question is an activist with an agenda. Shes just a face for the faceless.These sort of cases arent cheap , but i doubt the MSM will dig deep enough to find where the funding is from. Its no secret that its a successful businesswoman called Gina Miller who has used her own money to challenge the method of trigger for A50. The right wing press hate her and openly encouraged the hate campaign against her. She had received death threats and appeared at court today with security guards. This woman is clean or the media would have shared what they found in her bins. She is to be admired. This from googled ‘Inside Question time’ article from 2010. Does the buck ever stop with Ken MacQuarrie? The buck never stops at McQuarrie. He’s as slippery as an eel. Reminds me of a one time boss who was the most useless manager in the place, yet the top brass thought he was marvellous, mainly because of his sycophancy and brown nosing. I see that Tony Hall has moved Ken MacQuarrie upstairs. As ‘Director for Nations and Regions’, will he still be exercising control from his vantage point in the granny flat? She may not be “BBC staff” but the BBC still has a duty to ensure that the company which produces QT FOR the BBC abides by the BBC’s impartiality regulations. So, for me, that means the BBC is entitled to insist that Fuller is removed from the post she currently holds. It is absolutely clear that she is abusing her position in order to pack audiences with people who share her political views. That is surely a sackable offence particularly when her irresponsible actions potentially bring the BBC into disrepute. Keep up the pressure Bella. See. THIS is what brings readers. Actual investigate journalism. Keep it up! I dislike Question Time and have almost stopped watching it because it makes me angry. Yet, I’m not convinced of the bias argument. Dimbelby makes mistakes but I think they are more to do with his age than any other factors. For me, audiences do come across as aggressive, insulting and ‘on the right’ but I think that’s perhaps a reflection of the state of political discourse in 2016 than anything sinister. The same could be said of the politicians who appear. Groups like UKIP are on a lot but they do reflect a strand of public opinion, especially in England and Wales. If Westminster had PR you would hear a lot more of them. Well said, Frank. We need to stop wasting our energies on issues like this. Well I know for a fact I was lined up to appear in the audience on BBC in the show running up to the announcement of results. But in the week beforehand, as I wouldn’t reveal if I was Yes or No – I was still undecided, there was no quote for that. And I think that is unfair. You end up then with only extremists or people who are just very very certain of their position. That is never a good thing. Maybe indeed it has led to this increasing movement to the Right and also to the Left. Highlander on question time! In the name of jesus christ! Ceart ma tha! He’s involved in the dancing on the graves of the multitudinous victims of British Terrorism too?, o my god. Pass the BOWK bag.